Science communication is important. Of course, if you’re reading this blog, you probably already know that. You might have spent some time looking for new ways to get your science out there — out to the public and other scientists. There’s also a good chance you’re already actively involved in communicating your research through social media, blog posts, classroom education and community events. But jumping right into science communication isn’t always easy and is sometimes intimidating. Not many scientists have thorough training in how to “talk science” with non-science audiences. Finding the right way to share your research can take time, something many future and practicing scientists don’t have a lot to spare. And still, it’s important. Even if finding a way to communicate your research always falls to the bottom of the to-do list, it’s still there, and definitely needs doing. Being able to discuss your research with other scientists, stakeholders, and non-scientists opens doors for your research, too. There are countless individuals who can benefit from or help support your research, so engaging them in your work isn’t just about checking the “outreach and education” box off your list, but can actually be beneficial to your career. 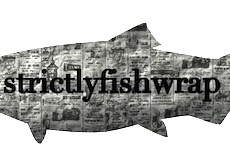 I learned this firsthand while working with fishermen to complete my master’s thesis at the University of Miami a few years back, and was able to share those experiences in Strictlyfishwrap. You can read more about it here. This past year, I was lucky enough to join the Florida Center for Ocean Science Education Excellence (COSEE Florida) team to develop a program aimed at helping ocean scientists communicate their research. Funded through a National Science Foundation (NSF) grant, COSEE Florida works to bring scientists and educators together to better inform the public about the marine ecosystem, stimulate community discussion, and increase awareness of the value of scientific knowledge. 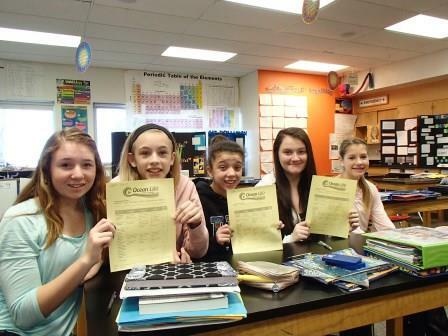 The winners of Ocean 180 would ultimately be selected by middle school students. Rather than asking a team of scientists and professionals to pick the winners, we asked nearly 31,000 middle school students around the world to tell us which scientist was deserving of the top prize. These students hailed from schools in coastal cities like Key Largo and San Diego, the landlocked states of West Virginia and Montana, and classrooms in Turkey, Australia, Taiwan, Bolivia, and 8 other countries. No matter where they lived or their proximity to the ocean, each student was able to voice their opinion and cast their vote. Last fall, ocean scientists around the US took up the challenge and sent us their videos explaining the importance, relevance, and significance of their findings. We did use a team of scientists and communication experts to narrow the field to the top 10, which were vetted for content and accuracy before being distributed around the world. But after that, it was all up to the students. Why middle schoolers? If you’ve ever spent time in middle school classrooms (or remember your 11-13 year old days), they are one of the harshest and most critical audiences out there. They’re great, but they aren’t afraid to tell you like it is! More importantly, middle school students are frequently seen as a population losing interest in STEM fields and career opportunities. Less than 17 % of students in these grade levels express interest in pursuing a career in STEM fields, as opposed to over 60% having a positive outlook on STEM fields in 4th grade. The decrease in science engagement is troubling and a concern for both educators today and the future of STEM fields. A report by Change the Equation (CTEq) in 2012 found that STEM jobs in the US were outpacing qualified applicants 2:1, indicating the drop in science engagement stretches beyond middle school years. 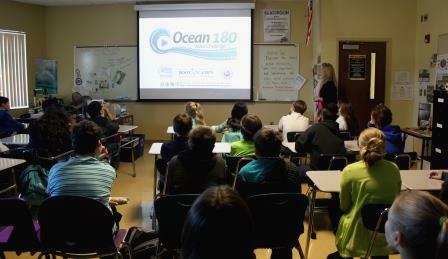 While Ocean 180 was designed as a way for scientists to communicate their research, it provided an opportunity to expose middle school students to possible careers in ocean science and the real-world applications of science. We all know that science is so much more than what’s in your 6th grade textbook, but how often do students get to see it in action? Scientists sharing their research with Ocean 180 had the chance to show students who they are, what they do, and explain why their research is important. The top 10 entries were shown in over 1,400 classrooms, each one evaluating the abstracts and providing feedback for participating scientists. That’s right, each scientist received up to 1,400 comments about their science communication and video production skills from students. The top 10 finalists in the 2014 Ocean 180 Video Challenge represented a range of ocean science fields, from shark research to deep-sea biology to marine archeology. At first glance, you probably have a guess which of these finalists caught the attention of middle school students. But after the ballots were tallied and comments compiled, we were all amazed to see which video abstracts were selected as the winners by students. You can take a look at who won here, with the top 2 places claimed by research of internal waves and the sequestration of carbon by single-celled organisms — diatoms and cyanobacteria. Not what you expected? You were thinking shipwrecks might win out over internal waves and sharks over single-celled organisms? How wrong you would be. Students were captivated by the story both videos told, and how they related a seemingly abstract concept to their everyday lives. They were (surprisingly) unbiased and voted for the videos that made sense and made them excited. Successful entries introduced the questions driving their research and how they looked for answers, but most importantly they explained why their research was important. Scientists in the top three videos related their research to issues students are familiar with, like climate change and conservation, exploring ways their research was important to both the scientific community and the students watching in their classrooms. So what did students have to say about the winning entries? So yes, science communication is important. But how will you be involved? Will you visit a school and talk about your career in science? Will you organize an event to talk about how your research is important to the local community or include stakeholders in your research? Maybe you’ll develop a video podcast to share your stories from the field, write an op-ed in your favorite news outlet, or even submit a video abstract to Ocean 180. Science sits at the forefront of critical challenges and debates all societies face today. Climate change, vaccines, genetics, energy production, water reliability… the list goes on. More and more, scientists will be asked to play a role in making research accessible to the public and in ensuring we develop a more scientifically literate and aware community. While finding ways to communicate your research as a scientist, and also finding the time to engage in outreach may not be at the top of your to-do list, the need for it is not going away anytime soon. Now is the time to think of how you can play a part in effective science communication and building a connection between science and the public. Ocean 180 was designed as a way to help scientists take those first steps into science communication. In just one 3-minute video, you have the potential to reach tens of thousands of students with your research, exposing them to cutting-edge ocean science discoveries and the potential in science careers. The program is an outlet for scientists to make a broad impact with their research, and a way to receive thorough feedback on their efforts. For information on how to get involved with the 2015 Ocean 180 Video Challenge, visit http://ocean180.org or contact us at info@ocean180.org.